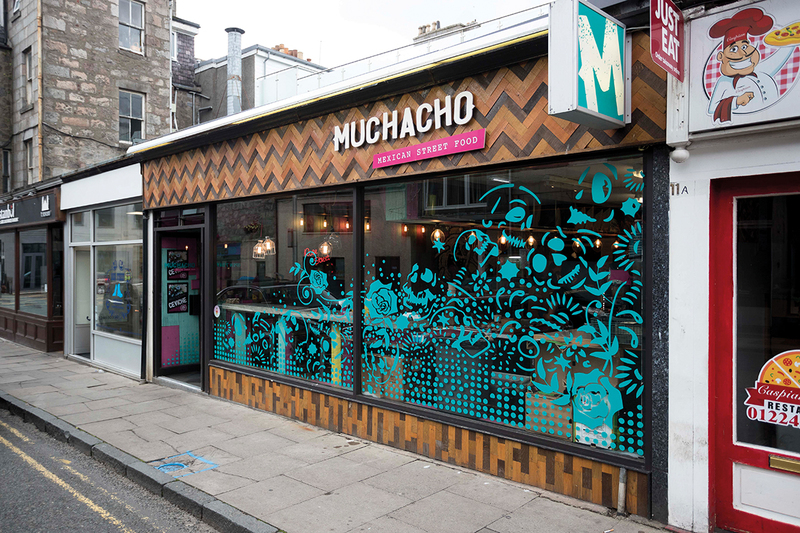 We headed for Muchacho on a weekday evening, and at 5pm the aromas leaving the shop were very appetising. The shop is mainly takeaway, but there is a window bench with high stools if your hunger is too great. You create your own dish, with the usual choices of burritos, enchiladas, quesadillas, nachos and salad, along with tacos and a naked burrito (just the fillings and accompaniments). I chose Pork Carnitas as my main filling, which was as juicy and tender as advertised, and paired it with salsa verde and guacamole – the usual suspects of rice and beans are included in the burrito. My husband had the Guerrero Beef and the chipotle salsa but reckoned he could have coped with the ‘Punch in the Face’ salsa which boasts four chillis on the blackboard and is ‘for the hot heads’. 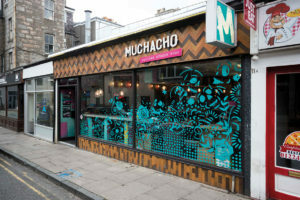 Muchachos is bright, clean and friendly and also sells Mexican Jarritos, bottled fizzy drinks straight from the mother country. 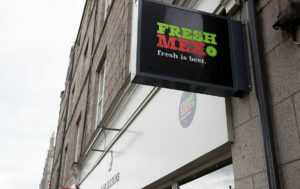 Fresh Mex duo Robbie Moult and Calum Wright started as a farmers’ market pop-up in 2015, and have very recently opened a restaurant of their own on Schoolhill, but it was to their food residency at the Adams and Hawthorn Sports Bar on Holburn Street that we headed on a Sunday night. The Adams is a bright and comfortable lounge with a pub feel and a wall of sport, perfect for a feed and catch up with the weekend’s sporting events. We ordered a nachos, a rice bowl and a burrito to sit in, with marinated chicken on the first two, and half and half mixed beans and beef & chorizo chilli on the burrito. We all declared the food well-cooked and really tasty, and great value for money too. There is a veggie option of smoky BBQ pulled jackfruit, as well loads of burger choices and a Cali-Burrito, a San Diego phenomenon which replaces the rice with French fries! 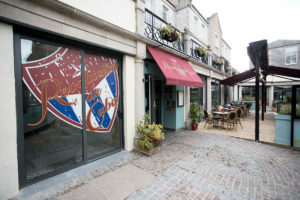 Final stop on our search for Latin flavours was Revolucion de Cuba, in the Academy Shopping Centre Courtyard just off Belmont Street. 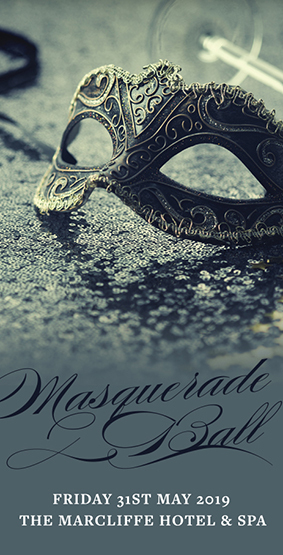 There’s a laid back vibe during the day and more of a party atmosphere in the evenings. Hemingway with a mirror ball may seem strange, but it works. The décor is an eclectic take on a shady Havana bar and cantina, in wood, tile and mosaic. The appetising menu isn’t strictly Cuban, but draws on influences from across South America, even straying across to Cyprus for fusion tapas like their wonderful little Halloumi Tacos. We sampled a robust plate of chorizo in a red wine and honey sauce and patatas bravas perfectly set off with a spicy tomato sauce and a garlicky aioli. It may not be painstakingly authentic, but everything tasted great! Revolucion de Cuba is a great choice for vegetarians in search of something different, as well as carnivores. The main course mushroom, bean and spinach burrito proved to be the cheesiest of comfort foods, while my co-reviewer demolished his excellent Caribbean Chicken Curry, singling out the balance of flavours and the zesty rice for special praise. There’s a great cocktail menu, with alcohol-free versions for those who are driving. The Virgin Zombie Killer came with enough fruit on top to qualify as dessert.